Communities have the right to know when developers plan to build polluting industry in our neighborhoods. Tell Governor Brown to support increased transparency and community decision making by signing AB 2447 into law! Homeowners, tenants, schools and local businesses have the right to know when a polluting facility may be a threat to their community. AB 2447 by Assemblymember Eloise Gomez Reyes will give residents of California’s most burdened communities notice of new or expanding polluting facilities in their own languages. That means that local agencies would have to take residents’ concerns seriously before approving another polluting source in their backyards. The right to know about the types of industries that are moving into our neighborhoods is common sense transparent governance. Take action to support AB 2447 today! Read more about why AB 2447 is a crucial first step to addressing long-standing pollution in many low-income neighborhoods and communities of color in this piece in Truthout featuring Leo Macias from Leadership Counsel for Justice and Accountability and Dania de Ramon from the Center of Community Action and Environmental Justice. AB 2447 is particularly important in communities where existing plants have already fouled the air, soil and water and have harmed the public’s health — because under existing law, residents don’t receive notice when new industrial facilities are located in their neighborhoods. Across the state from Fresno to Richmond, to the Inland Valley and Los Angeles, people keep their windows shut and stay indoors to avoid dust, diesel fumes, foul odors, and other contaminants that come from industrial projects that were approved without notice or input. AB 2447 is critical to winning important environmental justice protections for our communities and advancing Green Zones across the state! 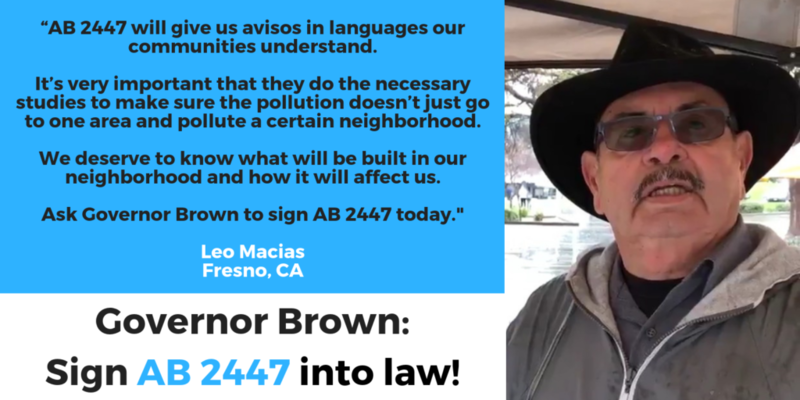 Will you help build Green Zones in California and protect our right to know by sending Governor Brown a message today to sign AB 2447 into law?